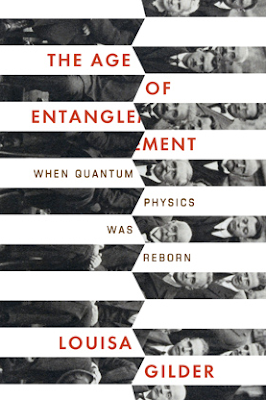 This might be the first time quoting from a Wikipedia science article helps us understand a book cover: "Quantum entanglement is a...phenomenon in which...states of two or more objects are linked together so that one object can no longer be adequately described without full mention of its counterpart — even though the individual objects may be spatially separated." With that in mind, none of the objects comprising this design make much visual sense without the others, but they add up to a beautiful and meaningful whole. And the word "entanglement" spread out between two of the elements? Frosting on the cake. Agreed. It is lovely and hypnotic. I can't stop looking at it. And I can't imagine that the picture by itself could be so engrossing. Cool! Great concept. I almost wish the photo was in color, but since that's probably impossible, silver foiled, or tinted with some color overlay. I think it should contrast more with the white stripes of the type areas. It also calls the double slit experiment to mind. Really cool. If anyone's interested, the photo is a group photo from the Solvay Foundatiion conference on physics, held in Brussells, Belgium, in 1927. Though noy being an expert, the main historical interest of that conference was that Einstein strenuously opposed the interpretation of quantum physics of Bohr and Heisenberg and the latter's uncertainty principle - funny enough, mostly at the restaurant, as Heisenberg himself tells in his autobiographical papers. ps. Bohr is second to the right strip, just above "Luisa" text, and Heisenberg is third to the right strip, in the upper row of the group. i miss the classic version of Batman.